[[Bowman Field]] is used by many organizations throughout the year for a whole variety of different activities. [[Clemson AFROTC]] can be seen using the field for practice marches on most afternoons. Clemson [[fraternities]] and [[sororities]] also use Bowman Field for their many activities like [[Powderpuff Football]]. 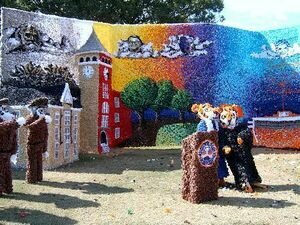 [[First Friday]] activities are usually held here and once a year, [[Homecoming]] floats are built on Bowman Field, in full view of all passing pedestrians and motorists. [[Habitat for Humanity]] builds a house for charity right on Bowman Field every year at [[Homecoming]]. Its use for parking vehicles for football games was discontinued in the 1990s over concerns of the damage done to the lawn. The two cannon located on the field were nicknamed Tom and Jerry by the class of []. Bowman Field is an extremely large, open grassy area in front of Sikes Hall, Tillman Hall, Godfrey Hall, Holtzendorff Hall, and Mell Hall. Named for R.T.V. 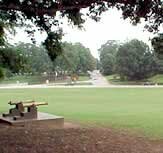 Bowman, an instructor in forge and foundry, and an assistant football coach who died in April 1899, it was originally the parade ground for Clemson cadets and the home of Clemson University's first football, baseball and even basketball teams. As an assistant coach, Bowman had been responsible for much of the clearing of the area for use as an athletics field. Bowman holds the Clemson distinction of having coached the very first intercollegiate match played at Clemson, a baseball game with Furman on April 24, 1896, which, unfortunately, the Tigers lost, 13-20. 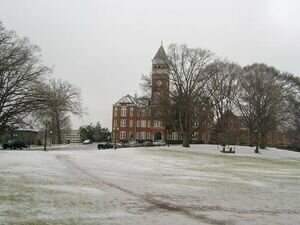 Today it is regarded as "sacred soil," having played such a large part in Clemson's history and being the central location for leisure activity for students. On most any day with nice weather you are likely to see students laying out, tanning, studying, throwing frisbee, playing football, volleyball, soccer, or even playing with their dogs. Bowman Field is used by many organizations throughout the year for a whole variety of different activities. Clemson AFROTC can be seen using the field for practice marches on most afternoons. Clemson fraternities and sororities also use Bowman Field for their many activities like Powderpuff Football. First Friday activities are usually held here and once a year, Homecoming floats are built on Bowman Field, in full view of all passing pedestrians and motorists. Habitat for Humanity builds a house for charity right on Bowman Field every year at Homecoming. Its use for parking vehicles for football games was discontinued in the 1990s over concerns of the damage done to the lawn. The two cannon located on the field were nicknamed Tom and Jerry by the class of 1953.